CoreTech System Co., a leading provider of plastics simulation products, announced the availability of Moldex3D R16. The software reportedly achieves a new level of efficiency and reliability in plastics simulation, and enables productive design-to-analysis workflows to accelerate the pace of product innovation. The company will showcase it at NPE2018 in booth S27079. Moldex3D R16 incorporates significant advances in processing speed, enabling 20 to 30% faster filling and packing simulation results, according to CoreTech. In addition, users will benefit from a new flow analysis program that can drastically reduce the time it takes to determine the best gating locations. Quick Flow allows users to rapidly test multiple gating iterations and quickly apply the optimal gate location to a regular flow analysis for in-depth validation and optimization. Users are able to minimize weld lines in the early analysis stage, saving a great deal of time and effort on running a gate location analysis, especially when analyzing large parts. 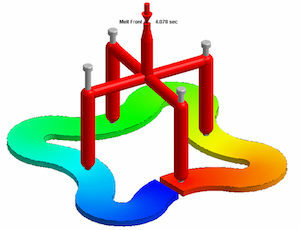 Moldex3D R16 offers new Viscoelasticity-Flow (VE-Flow) Analysis, which employs a novel coupling approach to realistically capture real-world visco-elastic flow behavior. Coupling visco-elasticity to flow enables more accurate predictions of warpage, optical properties and flow-induced issues to meet stringent quality demands. Composites part designers and engineers will benefit from a capability for predicting the behavior of composite materials. Moldex3D Resin Transfer Molding (RTM) Analysis now supports warp analysis, and enables users to directly import the deformation of the fiber mat from LS-DYNA for a better assessment of structural performance. Fiber-orientation predictive capabilities have been further deepened in this version by adding a patented simulation approach, which combines the Herschel-Bulkley model with yield stress and the Cross-WLF viscosity model. 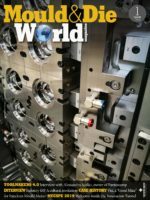 Other enhancements include predictions of cell size and cell density in polyurethane (PU) chemical foam molding and improved prediction of deformation in the compression molding charge. Expanding on the capabilities of previous versions, Moldex3D R16 further extends the non-matching mesh technology to mold inserts and mold plates, making it easier and simpler for users to simulate the entire mold by automatically generating solid meshes on non-matching faces. Additionally, Moldex3D R16 allows users to assign material properties to each individual mold component and visualize the temperature variation over the parting plane to optimize cycle time. The new release supports the simulation of valve pin movement, allowing users to take into account the influence of pin position and velocity during flow simulation. This can help validate the effectiveness of using pin movement technology to prevent flow marks and other cosmetic defects. A powerful model healing tool automatically repairs imported geometry before generating Boundary Layer Mesh (BLM) in Moldex3D Studio, which greatly reduces model preparation time. New visualization tools to measure distance between points and to display the value at a specific point are available. This makes it easier and more effective for users to compare and analyze results. Moldex3D R16 frees users from repetitive manual tasks by automating the entire simulation workflow with Moldex3D API, which allows users to customize the simulation workflow with predefined parameters, removing human error to ensure simulation consistency. Companies can now harness the power of API to create custom workflows; integration with other product design and structural analysis programs accelerates product development. “Major features and functions of this release are driven primarily by our customers’ feedback,” said David Hsu, President of Product Development.